Since arriving at Auckland a week earlier, Bob Ford had settled into a regular morning routine. Every day he would wake early and eat breakfast. He would then stroll over to the American Consulate message centre to see if orders for the California Clipper and her crew had finally arrived. The Consulate was a scene of organised chaos, the only route for messages in and out of Auckland for the Americans — military and civilian alike. Ford had just begun to make himself comfy in his normal spot in the waiting room when a clerk recognised him and thrust a piece of paper into his hand. Ford read it, and then immediately wished that he hadn’t. Strip all company markings, registration numbers, and indentifiable insignia from exterior surfaces. Proceed westbound soonest your discretion to avoid hostilities and deliver NC18602 to Marine Terminal LaGuardia Field New York. Back at the Pan American offices in Auckland, Ford showed the message to station manager Bill Mullahey and to the crew of the California Clipper. “They don’t ask much do they?” Said Mullahey, with more than a hint of sarcasm in his voice. He was right. In one short message Ford and his crew had been asked to do something that no commerical flying boat had ever done before — fly west from Auckland back to the USA. Rod Brown summed up the thoughts of the crew. Brown was right. To get back the California Clipper would have to carve out an all-new route for flying boats from Australia to the East Coast of America. Years before, when the Pacific route had first been charted, it had been done in careful stages, with fuelling ships and stations carefully planned and placed months in advance, using a flying boat specially prepared for the purpose and with a bountiful supply of maps and charts. The crew of the California Clipper had none of that — all they had was whatever they could scrounge up at Auckland and a commercial flying boat which, by the end of the trip, would have had to fly longer and further in a single trip than any Boeing 314 had ever managed before. They would be flying blind, and they would have to push themselves and — more crucially — their plane well beyond the limits of knowledge and safety. Nonetheless, they realised that they had to try. The librarian raised her eyebrows. “Yes please.” Replied Bob Ford, glancing uncertainly at Mullahey, the Pan Am station chief at Auckland. This had been his idea. “Also any geography textbooks. Stuff that might have information about winds or currents.” Added Rod Brown, helpfully. “We need to work out how to get back to America.” Explained Johnny Mack with a smile. Ford had a growing suspicion that Mack might be enjoying this. The librarian raised her eyebrows again. Soon the four men were busy at a table, poring over the entire geographic contents of Auckland public library. After several hours of plotting, calculations and guesswork a possible route began to emerge. The first stage of the journey was relatively straightforward — head right across to the west coast of Australia. This was not without risk as it involved taking the California Clipper across an awful lot of land (never a nice thing to do if your plane has no landing gear). It was the second stage of the journey that was the tricky one though, because the crew were faced with a difficult decision — to make a straight run for Africa, or cut north-west towards Java and India and then head to Africa from there. It was a difficult choice. The first option was obviously more direct, but it meant pushing their Boeing 314 to the very edge of her fuel limit. Just one bad piece of navigation, storm or headwind and they would be lost at sea. The second route would increase the chances of finding somewhere to fuel and rest up with friendly Dutch or British forces, but it also meant cutting through an area that was now a war zone. Either way, reaching Africa wouldn’t be the end of their problems. from the east coast of Africa they would have to fly across land again to Leopoldville (now Kinshasa) in the Congo. The good news was that Ford had heard there was a Pan American facility on the river there, which would hopefully be able to provide them with fuel. The bad news was that they would absolutely need it. Because from there, they would have to attempt a mammoth (but unavoidable) 3,550 mile cross-Atlantic flight to the Pan American base in Natal, Brazil. It wasn’t as far as the proposed hop from Australia to Africa, but it was still over the stated range of a Boeing 314. If they survived that trip, from there they could hop up the coast to New York itself. Ford and his crew evaluated their options. In the end they decided that the need for fuel meant they’d have to risk the north-westerly option. They would attempt to go via British and Dutch territory and pray that they beat the Japanese to it. Whilst Ford, Mullahey, Brown and Mack had been busy at the library, the rest of the crew had been stripping paint — an effort to remove all obvious signs that they were an American plane. It was hard, slow work, they explained to Ford upon his return, but they’d been making good progress. As they were talking, however, another message arrived from Pan American — this one marked urgent. The Japanese threat in the Pacific was increasing and the company were worried about their station staff in New Caledonia. California Clipper’s departure was now a matter of urgency — they must depart tomorrow, and they must stop off and evacuate all Pan American staff and their families from Noumea on their way to Australia. This caused problems for Ford. There were a number of spare engines at Auckland which he had been determined to dismantle and take with them for parts — without them any kind of failure en-route would almost certainly mean the end of their trip (or worse). There simply wasn’t time to both dismantle those engines and finish stripping all markings from the plane though. Ford now faced a choice — rescue the staff of New Caledonia, or increase his own crew’s chances of survival and of remaining anonymous in the face of the enemy. Ford looked his flying boat up and down and made a decision. The next morning, laden with spare parts but still sporting the remains of a large American flag on the top of her wing, the California Clipper left Auckland and began her long journey home. Although the evacuation from Noumea had gone to plan and they had reached Gladstone without a hitch, Ford was worried. “Nothing?” He said, looking at Johnny Mack and Flight Engineer Homans “Swede” Rothe. The Boeing 314 was a magnificent aircraft, but its size and range came at a cost. It was the first commercial aircraft that required 100 octane fuel to run — something that previously only high-performance racers and military aircraft had needed. 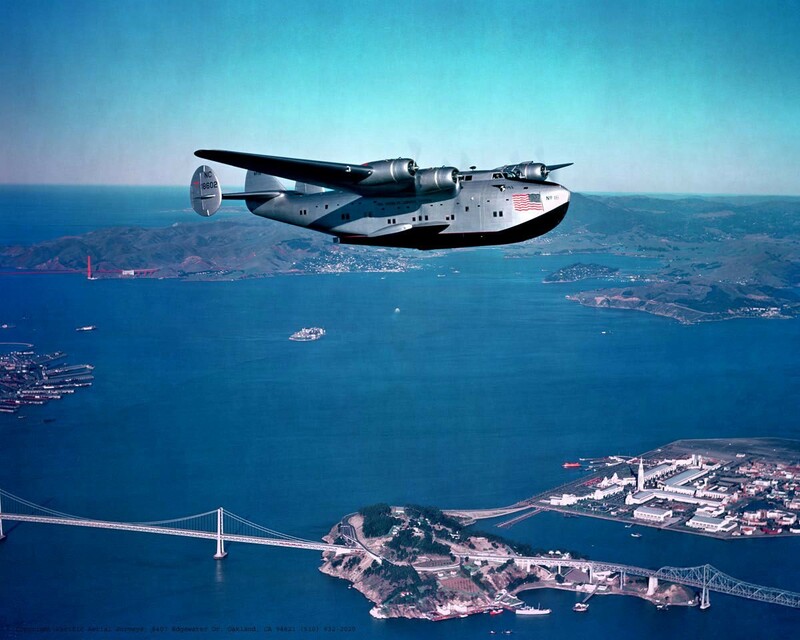 In peacetime this hadn’t been an issue — Pan American kept plenty of 100 octane at all its bases and stations for the flying boats to use — but the California Clipper was now flying into the unknown. And as Mack and Rothe had discovered, there was no guarantee they’d be able to get the stuff at the places they were now passing through. Ford performed some mental calculations and made some decisions. The eleven hour flight to Darwin had been a quiet one. Rod Brown and Jim Henricksen had spent most of the journey scouring the makeshift charts they’d copied or liberated from Auckland Library — an attempt to learn as much as possible about their route and the destinations they would be landing at. The second part was important, because they lacked the relevant radio frequency guides for this part of the world so it was entirely possible they’d have to land at each of their stopovers blind. For a flying boat the size of the California Clipper this was risky business. If they struck a piece of debris, a hidden sand bar or a reef during landing, then at best it would rip through the hull like a tin-opener and destroy the plane. At worst it would flip the flying boat as it tried to land, killing the whole crew almost instantly. Brown and Henricksen weren’t the only ones worried. The lack of 100 octane at Gladstone had made Swede Rothe realise just how careful they were going to have to be with their fuel. Not just on this leg of their journey, but on the whole trip. Swede and John Parrish, the California Clipper’s Second Engineer, spent most of the flight to Darwin carefully calculating the best balance of fuel mixture, propeller speed (in rpm) and manifold pressure to maximise their limited fuel supply. Both men knew that the Boeing 314 was a hungry aircraft if you let her be, so they needed to be economical without doing anything that might risk overheating the engines or adversely affecting her flying. For the rest of the crew — from Captain Ford to the two Flight Stewards Barney Sawicki and Verne Edwards, busy downstairs trying to work out how they were going to feed everyone on the journey — just the fact that the California Clipper was flying over land was enough to put them on edge. Nonetheless, the flying boat made it through her flight over Australia unscathed and made an orderly landing in Darwin harbour on 17th December. As soon as they were secure, Ford sent Mack, Brown, Parrish and Fourth Officer John Steers ashore to try and secure some 100 octane. The scene that greeted the four as they disembarked at the dock was one of pure chaos. Darwin was in the midst of an invasion scare. Worse, the arrival of the first freighter full of beer in months had resulted in a temporary breakdown of military order. “What the hell is this about? !” asked Johnny Mack of the harbourmaster, who had confirmed that there was 100 octane available, but that it would need to be ferried out to the California Clipper in jerry cans. His comments focused the four men’s minds on the urgency of the task at hand. Whether the Japanese invaded or not, more air raids were likely and the California Clipper was a huge, sitting duck out in the bay. It was vital they get out of Darwin as soon as possible. They begin the slow process of ferrying the precious 100 octane out to the flying boat and pouring it, can by can, into her vast fuel tanks. This was a painfully slow task, one that was made even slower by the weather, which flipped between clear skies and torrential rain. When it was clear, fuelling could proceed — with the crew maintaining a nervous watch on the horizon for any signs of Japanese bombers. When it was raining they had to cover the tank inlets to avoid contaminating the fuel with water and take cover inside the plane. Finally, by 2AM they were finished. With sunrise, and their departure, just four hours away, the exhausted crew headed to their bunks to try and grab some sleep. As the day dawned, the California Clipper climbed back into the sky once again. Commandant Colonel Koenrad was in the squadron operations room at the Royal Dutch Naval Air Station at Surabaya when an unknown contact was reported by his combat air patrol. He stifled a groan. The Japanese had been attacking the island almost daily, their bombers destroying irreplaceable planes and supplies on the ground whilst the escorting fighters gradually bled his limited air forces dry. Both Koenrad and his men were frayed and frustrated. Maybe this, though, was good news — whatever this aircraft was, it was alone. Was it friendly? It seemed unlikely. Perhaps, he hoped, the Japanese thought his command was so wounded that their bombers could come in unescorted now. If so, they were wrong. Koenrad and his airmen were still determined to fight. He scrambled three fighters to intercept. “Friend or foe? !” Asked Johnny Mack from the seat next to him, craning his neck to try and see the incoming fighter. Bob Ford raced forward, motioning Steer out of the pilot seat and taking his place. The Captain had been afraid of this ever since they’d left Darwin. If it was the Japanese they were sitting ducks, so he hoped it was the Dutch. Even if it was though, without the relevant radio frequencies they had no way of contacting them and letting them know they were friendly. Ford had raised this fear with the harbourmaster at Darwin, who had promised to try and get a message ahead to the Dutch at Surabaya, just to warn them that California was coming. Unbeknownst to Ford, that message had never got through. Down on the ground meanwhile, Koenrad was pondering events. He signalled the patrol aircraft which had first made contact. DO YOU SEE ANY IDENTIFYING MARKS? It was clearly a flying boat, he now knew, but whose? It seemed to be without markings. Surely it was the Japanese? The patrolling pilot certainly thought so and was asking, repeatedly, for permission to shoot it down. The three interceptors Koenrad had sent racing towards its position were also asking the same thing. But something made Koenrad hold back. He reiterated his orders to hold fire, and told them to take another look. On the California Clipper itself the situation was getting tense. “Three more fighters incoming!” Warned Johnny Mack. On the ground Koenrad was getting impatient. The flying boat was getting near the base and he needed to make a decision. Suddenly his radio crackled into life. AMERICAN FLAG PAINTED ON THE TOP SURFACE OF THE WING. PLEASE ADVISE. In bizarre fashion, Ford’s decision to abandon the efforts to disguise the California and save the Pan Am staff at New Caledonia had also saved the plane too. Koenrad made his decision. MAINTAIN POSITION. LET HIM PROCEED. After the scare with the fighters Ford was just happy to have landed outside the harbour without incident. Still, he had expected more of a welcome than this. At both Gladstone and Darwin their arrival had been greeted by the sight of a boat racing out to meet them from the harbour. As Ford looked out of the cockpit window, however, all he could see here was a man standing on a patrol boat parked some distance away in the inner harbour waving at them. “Shall we follow him in?” Asked Johnny Mack. Trying to be as unthreatening as possible, Mack taxied the plane towards the inner harbour. Having passed the threshold the boat finally approached and signalled that they should moor up to a buoy. Having done so, Ford hurried downstairs and opened the door. Ashore, Ford found himself explaining the situation to Commandant Colonel Koenrad. “That’s understandable.” Replied Ford with a wry smile. The Dutch had been more than welcoming to the air crew once they had discerned their identity, providing them with food, spare parts and supplies. There was one thing Koenrad insisted they couldn’t spare, however, and that was any of his precious 100 octane. Swede had been dreading this moment ever since they’d struggled to find supplies at Gladstone. It wasn’t just that the Boeing wasn’t designed to fly on regular petrol , it was that no-one had ever even tried. There was simply no telling what would happen if they attempted it. If they put 90 into California she might fly okay, or all her engines might overheat and blow up. Nobody knew. At the very least, Swede was certain that it would cause power problems — probably pre-detonation and backfires. Not only could these damage the engines but they might prove fatal during takeoff or landing. That was if there would be enough power to take off at all. What choice did they have though? The next day, loaded with fuel on which no Boeing 314 had flown run before, they departed on the longest leg of the journey so far — the 2,500 mile flight to Trincomalee in modern Sri Lanka. Every time it happened the California shook, as if in a violent storm. And Swede flinched. “Backfiring on number three!” Johnny Mack shouted. “Back off the mixture Swede!” Ford ordered. Rothe quickly moved the fuel mixture controls towards the rich end of the range. They’d been trying for hours to find a 90 octane fuel balance on which they could run. They simply couldn’t afford to run the mixture too rich all the way — not only did it eat hugely into their precious fuel supply but it was pushing the engine temperatures dangerously over the red-line. The trouble was that every time he tried to lean the mixture out the violent backfiring would start. Swede was pretty certain he now had. “Aye Skipper, but those head temps aren’t coming down any.” Swede was concerned. His instruments showed that the engines were running just below the red line, but they were also having to fly far lower than the crew would like. Meanwhile, back from the cockpit Rod Brown had his own problems. Using the rudimentary atlases and charts they possessed he had so far managed to plot a decent course, but as night fell they passed the northwestern end of Sumatra, their last positive landfall between here and Trincomalee. From here on out it was all maths, magnetism, stars and dead reckoning. By morning they had been airborne for almost 19 hours, flying on Swede’s careful balance of 90 octane and on Brown’s ‘guestimated’ route. They knew they should be nearing land, but the layer of low-lying cloud beneath them was a problem. Swede eased back on the mixture and they slowly felt their way down. Soon they were flying a mere 300 feet above the waves. They began to look for land. Ford squinted, following his First Officer’s gaze to the object on which they were closing fast. Suddenly his eyes flew wide. By now the conning tower was visible, a Rising Sun painted on its side, men running towards the large gun on its foredeck. “They’re aiming that thing at us!” Mack warned. “Max climb! Let’s get the hell out of here!” Ford cried. With the sluggish Boeing 314 resisting the change, Ford and Mack hauled back on the yoke desperately seeking the cloud cover above. They blazed directly over the submarine mid-climb, the deck gun below swinging round as it began to track them through the sky. After what seemed to the crew like an eternity, they finally broke through into the clouds. It was just in time. A bright flash from below illuminating the clouds around them. The men braced for impact. Luckily, it never came. An hour later the California Clipper was down and secure at Trincomalee, to the relief of everyone on board. To a man though, they knew that they were still a very long way from home. Continue to part three: Ford and his crew battle the weather and rivers of Africa.